We get many inquiries regarding what many people refer to as "butterfly houses." To many people in the industry a butterfly house refers to a living display of butterflies in a conservatory or atrium atmosphere that is open to public viewing. What people purchase for their gardens should be referred to as a "hibernating box." They are meant as places for certain species of butterflies to overwinter in. Call it whatever you feel comfortable with, but usually they do not work. With the first warm winds of spring we all get the itch for our gardens and visits from our winged friends. Wanting to provide as much for our charges as we could, we buy what we feel is best for them. Now, if you have purchased a butterfly box do not give up. I always say that they are like chicken soup for a cold. They may not help, but they sure do not hurt. And if yours works, then you'll have bragging rights to the usefulness of your garden. When most folks buy a box, they quickly place it in the sunniest part of the garden in hope that the butterflies will swarm to it like Purple Martins to a bird condo. Not so. First, they would not be used until the Fall. Second, the butterflies that utilize them prefer the safety of the woods as opposed to the open garden setting. To make them more effective they should be placed in a woody section of your garden if it is possible. The host plants for the species preferring boxes should be planted nearby. Mourning Cloaks, Anglewings and Tortoiseshells will be most prone to use them. Elm, Willow, Nettles, Poplar, and my personal favorite Hops, are the favored host of your would-be tenants. Later, blooming nectar sources will also increase activity. Sedums and Asters are good choices, but your personal favorites will work also. 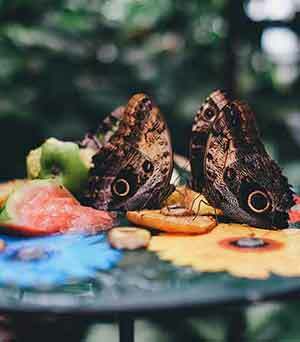 By having the nectar source close by, they may be more likely to visit your butterfly house. Many people have suggested painting the outside of the structure with purple and yellow flowers to attract attention. Once again it can't hurt. Another point of debate is the proper height. Some say 4-5 feet, others say higher, others lower. I say put it where you like it. During the winter, these hibernators can be found under logs on the ground, in the eaves of houses and state park signs, or in the grasses. They will overwinter at the any level where opportunities exist. As the cold winds of winter approach, there may not be much time for house hunting. Should you buy a butterfly house? Yes! It would be better to build your own from the plans supplied by the Butterfly WebSite. Will it work? Probably not! But they look great and add to the charm of any garden. I have one. It is placed right in the sunniest part of my garden. It is at the wrong height and probably facing the wrong direction, and probably a lot of other wrong things involved. But who cares. It makes for great conversation! It looks great and it won't hurt. Below you will find a nice selection of butterfly houses for sale, but if you feel up to it, you can always try to make one yourself with our Butterfly House Plans. The Butterfly Website receives a small commission on sales made through the links below.